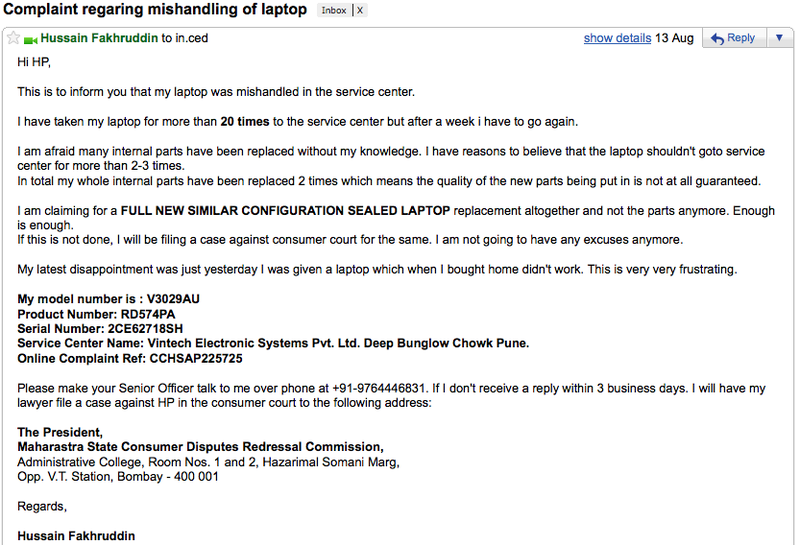 Don’t BUY HP LAPTOPS In INDIA. PERIOD. EDIT: I found this most suitable. Some years ago I got a laptop from HP. 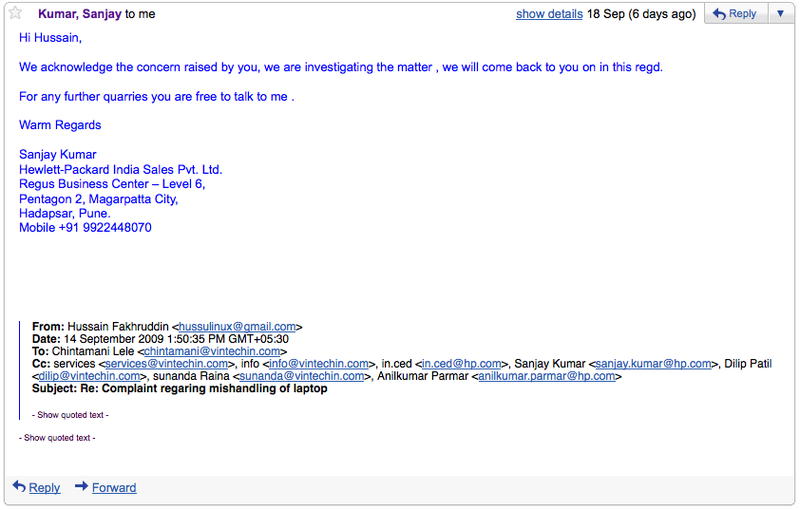 The irony is that my laptop was used by HP service center more than me! 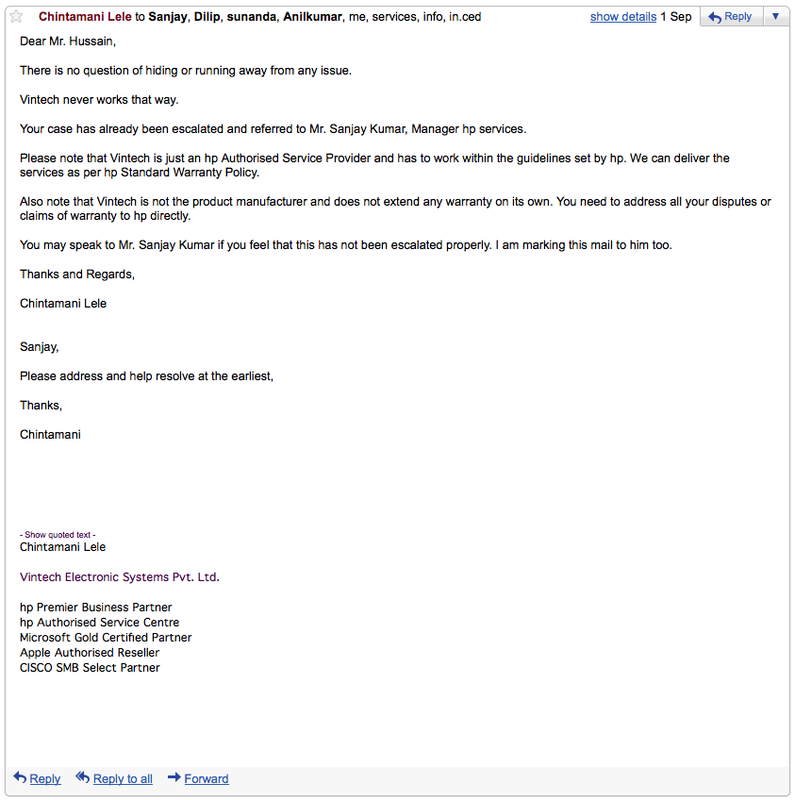 The following email screens will explain what kind of Customer Help is provided by the so called MNC Hewlett-Packard! So I didn’t receive any reply, No calls! After 8 days, I wrote another email to them! 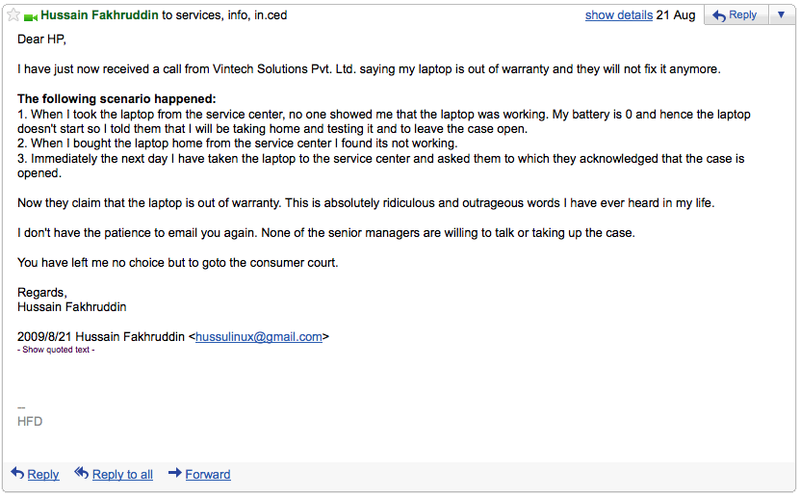 As soon as I sent this email, I got a call from the service center! 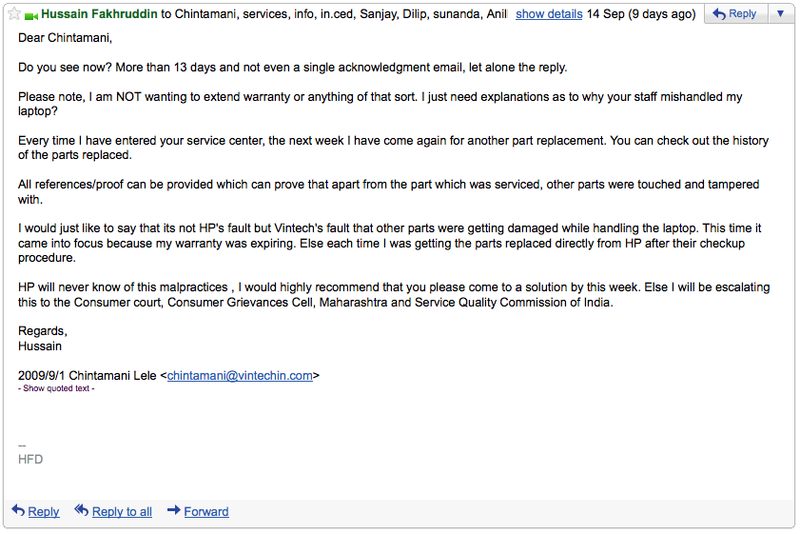 Immediately Mr. Chintamani Lele from Vintech replied !! Immediately I asked him and ETA to which he replied Next Monday! But its already passed Monday! And no reply yet. So I shoot out another email! And on 23rd Sept, I get this in reply! Should I laugh or cry?! The guy was on leave until 21st and still on leave on 23rd! Wow HP! This entry was posted in me on September 23, 2009 by Hussain Fakhruddin. There is a strange yet fascinating feeling whenever I come across Chinese people. Their overall personality, aroma, the way they carry themselves , the hard work they do, their laziness — Almost everything! Kolkata, my hometown has been a home for the Chinese since long ago. Its the only city in India to have a Chinatown and I have good Chinese friends too! Even my sister has a best friend who is Chinese! I just love Chinese food so much! My dad deals with China day-in day-out with his import/export business. Moreover I went ahead and did a Chinese crash course! I even visited China in April 2009! Chinese people are very fragile and delicate in looks but too strong mentally. They are workaholic(most of them) and hardworking. May be this is the reason why China is the GOD of manufacturing. While I was in China , I found products which were so cheap no Indian company could afford to make. The high availability of manpower and poverty has made China a hub of manufacturing! I was once in an Autobus in Kolkata where I came across a chinese girl who worked at a call center. She was highly sophisticated and resembled the actual people in China. Too fashionable! From head to feet. Colored hair, imitation jewelery, state of the art footwear and what not!! Chinese people love fashion, they get bored with old ones too quickly and want new things coming up as soon as they can! When you go and buy a chinese product, the quality will be too low but it will be a unique and stylish one. Take for example Chinese mini f ans or Chinese watches or mobile phone or rather many plastic products from China. They are quite fashionable but fragile. Not to forget I got myself an IPHONE Clone phone. It looks exactly same! I got it for US$80 only. Its a usable phone with 2 batteries, charger, earphones and iphone(designed in california) box! It was just so tempting I took it! In India, Chinese community is treated very separately. A friend of mine was not allowed to even attend Indian IDOL audition as he was Chinese. No reasons specified! They mostly adopt Christianity but rarely go to Church(correct me if I’m wrong!) , they visit Chinese & Buddhist temples and celebrate Chinese new year as their main festival. The elder generation Chinese in India have shops of Shoes Manufacturing , Restaurants and Beauty parlors. One of my very good friend’s family is associated with all three. But the younger generation is job oriented. They prefer instantly high paying jobs than good old business. Some move out of India to Taiwan , Canada and Australia but not to Mainland China. They have very well accepted Indian culture. Indian communities have a mix bag of relations. Some accept them, some treat them as aliens. But one must remember, even though they look different, I know they are all Indians by heart.. 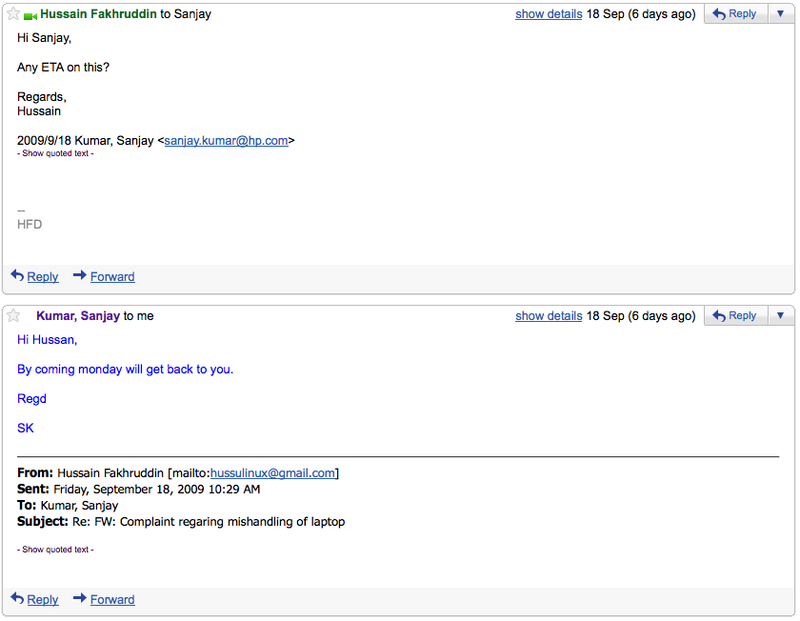 This entry was posted in me on September 5, 2009 by Hussain Fakhruddin.